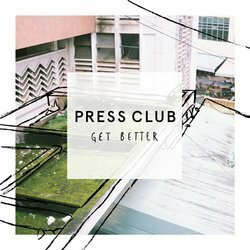 ‘GET BETTER’ is the first release from PRESS CLUB since their debut LP, Late Teens. The lyrics of Natalie Foster take an about-face in ‘GET BETTER’, her ire being caught by the insincere actions of others. Although the song has a palpably aggressive energy, it is perforated with the exposed vulnerability that is omnipresent in her performances. The song was written collaboratively in the band’s self-built studio at the foot of Westgate bridge in Port Melbourne. As with all of their catalogue to date, ‘GET BETTER’ was recorded and produced by the band themselves. This time calling on Woodstock Studios in Balaclava, Melbourne to put their songwriting to tape. Wanting to not deviate from their aim of capturing real, organic, human performances - inaccuracies and all - they opted to track ‘GET BETTER’ live. Mirroring Frank Zappa’s notion that no two performances are ever identical, and that wherein lies the magic. ‘GET BETTER’ is out now and the band will do a limited run of shows around Australia to repatriate themselves with their beloved Australia after a month in the Northern Hemisphere which includes a sold out London headline show and festival spots at Manchester Punk Festival, The Great Escape, Liverpool sounds City and Belgium’s Groezrock.